Bono's boys don't pack light, and when trucks tried to load up 390 tons of equipment in the middle of the night for U2's tour, Dubliners went nuts. Dubliners angry over the around-the-clock dismantling of U2's monumental concert stage mounted street protests Tuesday, snarling the Irish band's plans for the next stages of their European tour. Residents around Croke Park stadium said their aim was to embarrass Dublin City Council and the Gaelic Athletic Association — which authorized the all-night noise — not delay Ireland's most famous musical export. 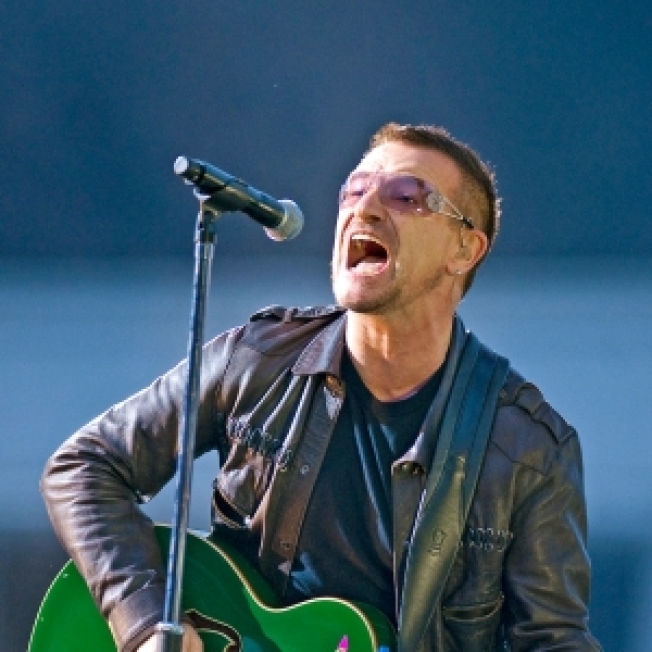 But U2 managers said the protests meant more than 50 trucks carrying much of the band's 390-ton stage, TV screens, lighting and sound equipment missed their intended morning ferry. Some trucks did depart the stadium several hours late as protesters stood aside. But tour organizers said it was too soon to determine whether any of U2's tightly scheduled concert dates in Sweden, Germany and Poland would be affected. "We should all not be talking to you and (should be) on a boat," the tour's production director, Jake Berry, told reporters as several dozen residents protested beside three road junctions outside Croke Park, Ireland's largest stadium. Berry said U2 did not want to risk accidents by driving any heavily laden trucks past protesters straddling roadways outside the stadium. He expressed surprise at the protests, even though plans for them have been widely reported in Ireland since last week. Berry said he wasn't sure whether Tuesday's lost hours — and potential problems fitting trucks on later ferry services to Britain — would jeopardize any upcoming concert dates. "It affects the tour schedule. Read that any way you want," he said. Croke Park Area Residents' Committee spokesman David Purdue said that no one was "interested in any way in delaying U2 in any shape or form." "This is primarily to get Dublin City Council and the Gaelic Athletic Association to take notice of us and recognize the damage they're doing to the local community," he said. He said the band felt "pure disappointment. It's just really put a damp squib (sponge) on something that was a fantastic experience and fantastic show." The protesting Dubliners complained that the council and sports authorities should not have cleared U2 to dismantle its stage over a continuous 44-hour period starting at 1 a.m. Tuesday — just two hours after the last of three Dublin concerts concluded before roaring crowds of 80,000. In practice, the schedule means the area will suffer heavy nighttime noise for more than a week. Activists from the residents committee, which plans protests throughout Tuesday, said they were willing to let U2's truck convoy carry out the most critical parts of the stage, including a telescoping bank of television screens and the stage's disco ball-topped spike. The U2 concert promoters, MCD Productions, delivered a legal letter to the protesters, warning they could be sued for any financial losses incurred by the promoters, U2 or others with a financial stake in one of the world's biggest musical ventures. U2 has three "Claw" stages — one of which is being constructed, another being dismantled, and a third being transported or in use any given moment of the tour. The band is scheduled to perform in Goteborg, Sweden, on Friday and Saturday; Gelsenkirchen, Germany, on Monday; and Chorzow, Poland, on Aug. 6. Tour directors declined to specify the next destination of the Claw being dismantled in Dublin.